No worries with your plants for up to two weeks! 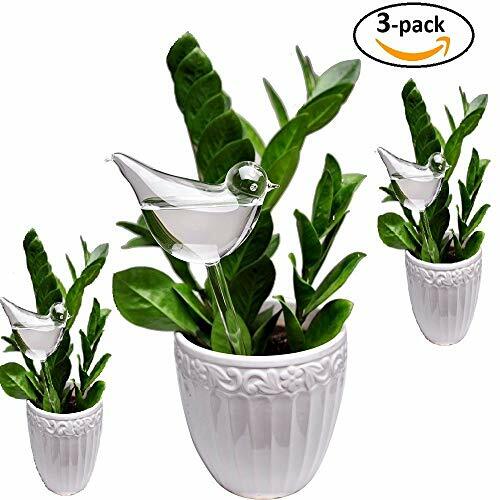 USEFUL: Grow healthier plants by preventing over or under watering.Automatically water your plants up to 2-3 weeks, perfect for vacation and useful to your plants.results may vary due to different conditions, soil or plant types. SİMPLE TO USE: Just push the tube into soil. the water will be slowly emitted and automatically watering your plants without the need to set. PACKİNG İNCLUDED: 3 bird clear durable glass. prevented from breaking in polyfoam box. SUİT FOR:varieties of potted plants, houseplants, patio plants, hanging plants and outdoor gardens. If you have any questions about this product by E-kay, contact us by completing and submitting the form below. If you are looking for a specif part number, please include it with your message.